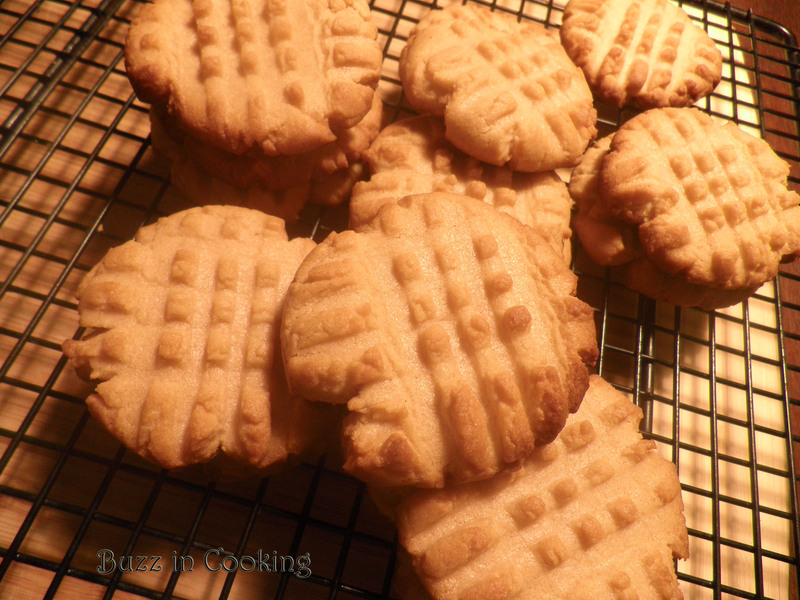 You will go cooky for these peanut butter cookies. Yummo! Blend together butter, peanut butter and sugars in a mixing bowl. Beat in eggs. Slowly add flour into mixing bowl and mix until completely blended. Put batter in refrigerator for 1 hour. Roll into 1 inch balls and put on baking sheets. Flatten each ball with a fork, making a criss-cross pattern. Bake in oven for 10 minutes or until cookies begin to brown. Need to use some of those vegetables in your refrigerator? Saute them in a little avocado oil, throw in some cheese and eggs and wrap it in flour tortilla and serve it with your favorite salsa. I like to use wheat low carb tortillas. Heat oil over medium high heat in a medium frying pan. 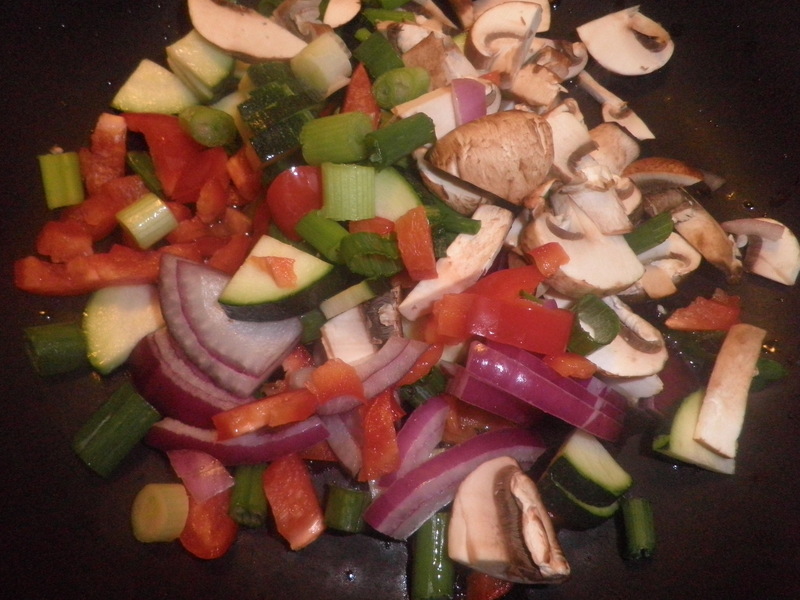 Add vegetables and spices and saute until cooked. Add eggs and scramble until cooked. Top with the shredded cheese, cover and remove from heat. 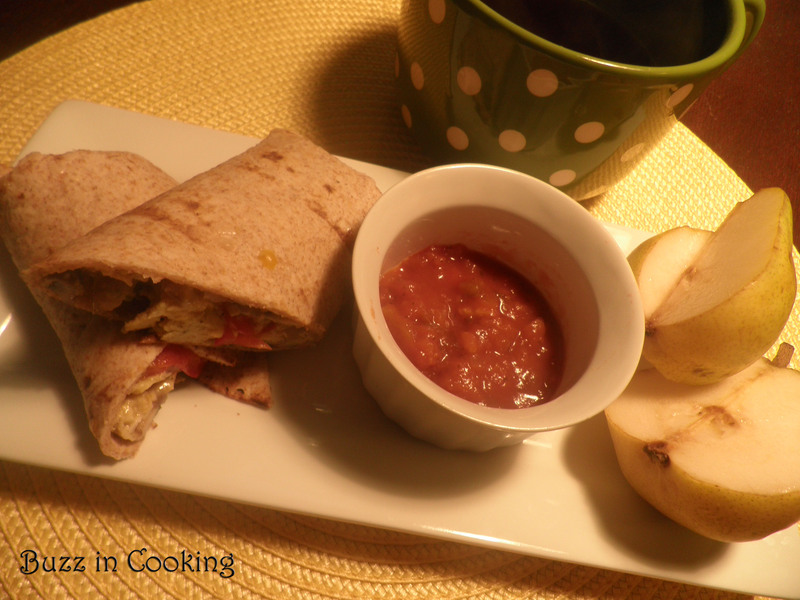 Place ingredients in a warm tortilla. Fold sides inward and roll tortilla from the front and roll until closed. Cut in half with flap side down. Serve with salsa. 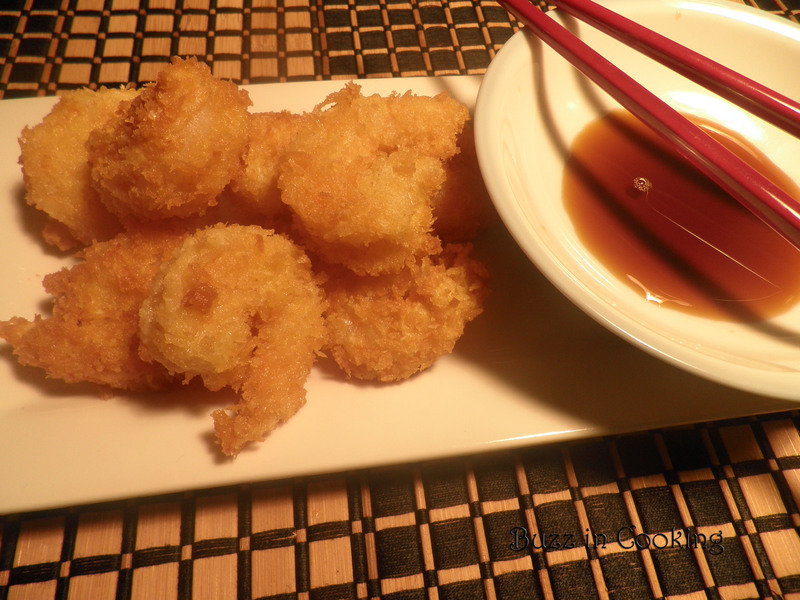 Panko shrimp is a lighter version of breaded shrimp. Yes it is still deep fried, but oh so good. Heat vegetable oil over medium high in a sauce pan or deep fryer. Dredge cleaned shrimp into flour shake off excess, dip into egg mixture, an coat with panko bread crumbs. Place into heated oil and fry for 2 to 3 minutes careful not to burn. Place on a paper towel lined plate to drain off oil. Repeat until all shrimp are cooked. Serve hot with sauce. 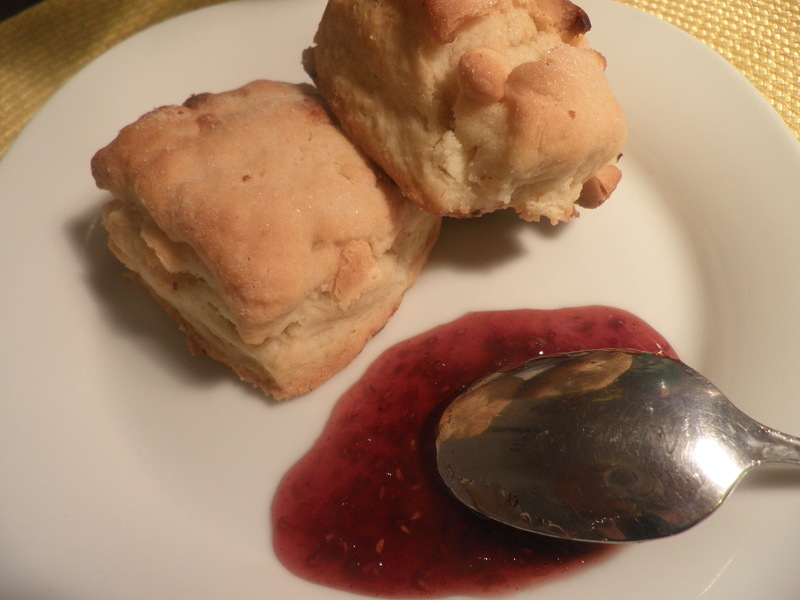 This my first time making scones and I chose a great recipe from Smith Bites website. They serve theirs with a lemon curd which I’m guessing is out of this world. 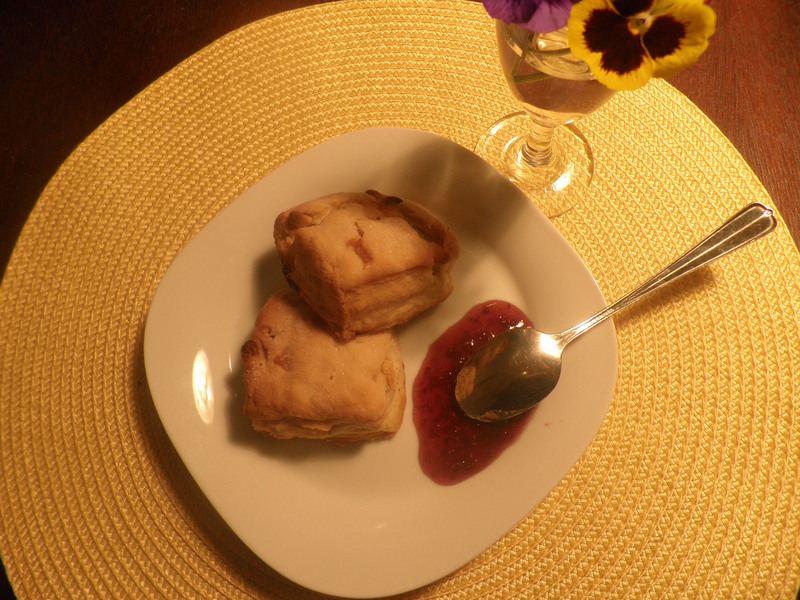 I decided to try it with a raspberry jam. Wow. This is a winner! I added a little more white chocolate. These are amazing served warm or room temperature. Remove paper from the frozen stick of butter and use your grater attachment in your food processor. Remove from bowl and refreeze until ready to use. Combine milk and sour cream in a small bowl and place in refrigerator until ready to use. Combine the flour, sugar, baking powder, baking soda, salt and lemon zest in the food processor (no need to wash from butter beforehand) and pulse a couple of times to mix. Add frozen grated butter and pulse a couple of times until butter is coated. Add milk and sour cream mixture and pulse until combined. Place flour on your work station and place dough mixture on top and dust it with more flour. With floured hands knead dough 6 to 8 times while adding flour as needed until it’s less sticky. Roll dough into a 12×12 square. Fold into thirds as if you are folding a business using a spatula if necessary to help lift from work surface. Lift short end and do the same thing in thirds to form a 4×4 square. Put dough on a flour dusted plate and place in freezer for 8 minutes. Transfer dough to a flour dusted work service and roll into a 12×12 square. Take chocolate chips and spread evenly over dough and gently press them into the dough. Roll dough, pressing to form tight log and press to form a 4×12 log. Using a sharp floured knife cut lengthwise into 4 squares. Cut each square diagonally in two. You can leave this size, but I cut them again to make them smaller. Place on a parchment lined cookie sheet and brush with melted butter. Sprinkle with sugar and bake on middle oven rack for 23 minutes. Transfer to wire rack and cool for 10 minutes. You’re gonna love them. 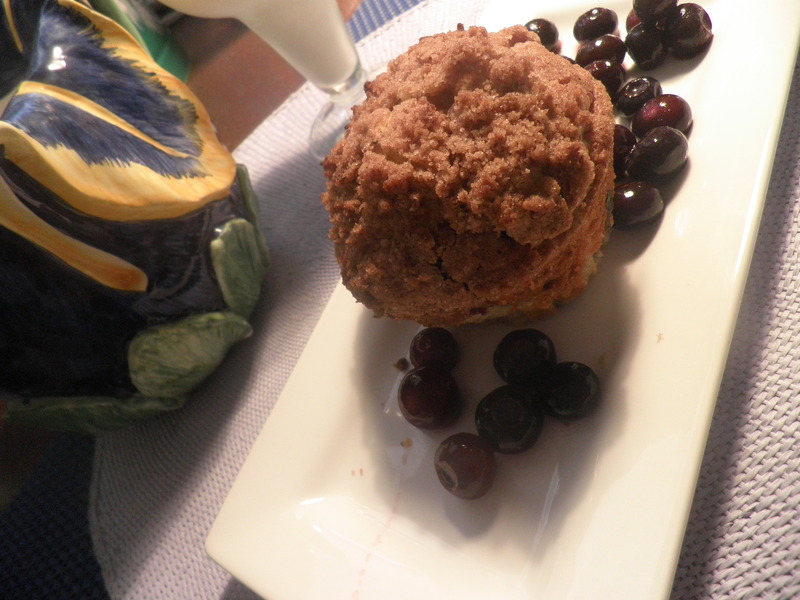 You have to give these amazing blueberry muffins with a yummy cinnamon crumble on top a try. 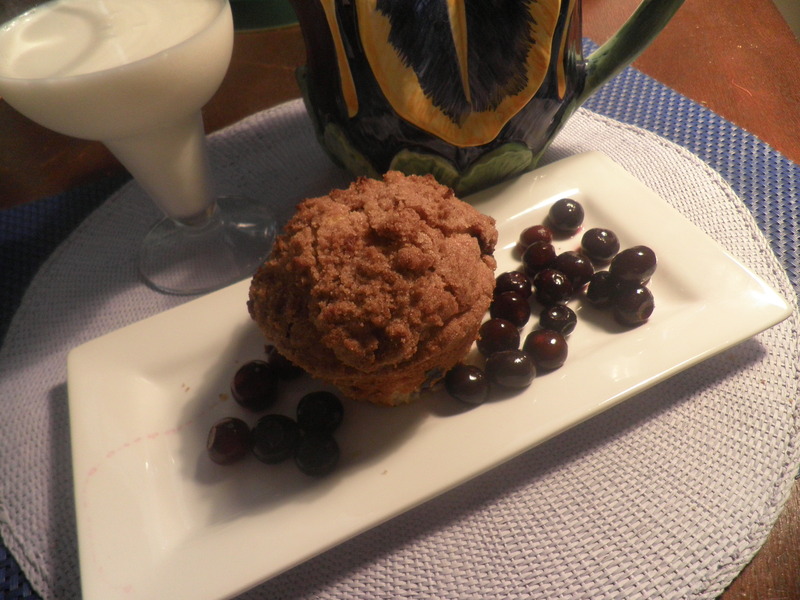 Serve this with some cold milk or a nice cup of tea or coffee. This chicken is so creamy and delicious you’re gonna want to put this on your list of favorites. Heat frying pan over medium heat and add olive oil, butter, and garlic. Be careful not to burn garlic. Add chicken until cooked through and juices run clear. Meanwhile cook pasta. Remove from pan and set aside. Add onions to the oil, butter, and garlic and saute until translucent. Add bouillon and water and cook for 10 minutes on a low simmer. 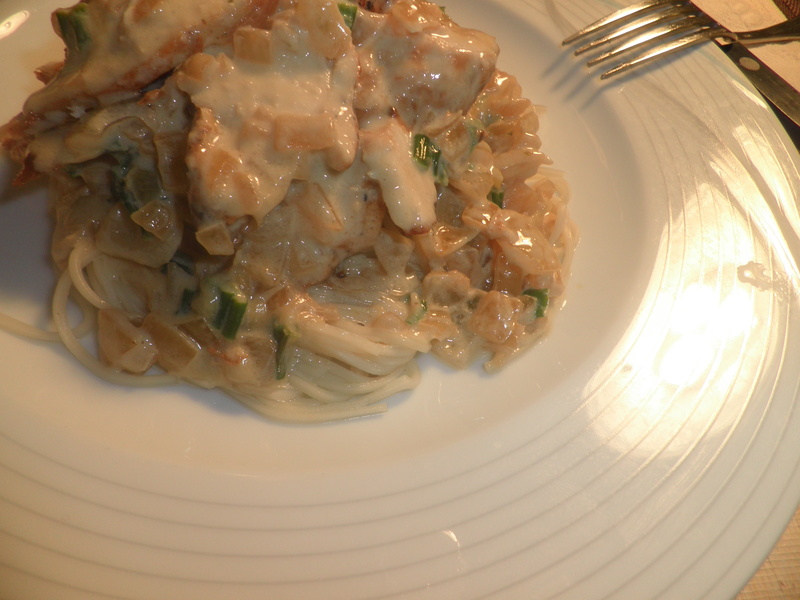 Stir in cream, green onions, and Parmesan and cook for another 5 minutes. Slice chicken diagonally and lengthwise. Twirl pasta on a plate and top with chicken and pour sauce on top. Enjoy.